This year is the 26th consecutive year that the Lloyd Center has conducted a butterfly count as part of the nationwide survey organized by NABA, formerly the Xerces Society, so named after the Xerces Blue that is the only U.S. butterfly driven into extinction. The same five sites (Lloyd Center property, DNRT Smith Farm, powerline easement through UMass-Dartmouth property at Lucy Little Road, Turners Pond/headwaters of the Paskamansett River, and the south end of the Acushnet Cedar swamp at New Plainville Rd.) are visited each year during which all butterflies encountered are identified and counted. A total of 29 species and 409 individuals were documented on July 21, 2013 despite a mostly cloudy day. This was the second year in a row with 29 species, the highest number observed over the past 26 years. Smith Farm had the highest diversity (21 species), no doubt enhanced by DNRT’s effort to restore the three fields on the property. The Plainville Road site, which includes the vast wetlands restoration project that compensated for the loss of wetlands when the Bristol County House of Correction was built had the highest number (141) of butterflies and the second-highest diversity (19 species). Although there was much overlap in species among the five sites, each site contributed at least one species not seen at the other sites. The local and declining Silver-bordered Fritillary that continues to be seen in wet meadow habitat along the powerlines on UMass-Dartmouth’s property and the presence of Sachem Skippers, a southern species that, for the past two years has shown up in large numbers along the Southcoast were the highlights of the count, although the Tiger Swallowtail may have been the most dramatic (see picture). 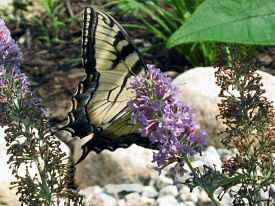 This spring the Lloyd Center restored a section of its butterfly garden, adding a dozen butterfly bushes (buddleia) and has been rewarded with the largest number and diversity seen during the counts. The Massachusetts Butterfly Club has used NABA count data, Massachusetts Audubon Butterfly survey (1990-1995) data and observations by its membership to document a significant trend in Massachusetts’ butterflies, namely the loss or reduction of northern species near the edge of their range in Massachusetts and the colonization of southern species previously thought of as rare strays. This highlights the importance of long-term data sets such as those current being complied through the Lloyd Center’s Southcoast Biodiversity Initiative and Climate Science Learning Project.